Huntington Beach, Calif. – June 17, 2014 – AnyMeeting (www.anymeeting.com) today announces its partner API, which enables service provider and platform partners to integrate all or portions of its full-featured, browser-based web, video and phone conferencing tool into their own solutions. AnyMeeting is one of the first WebRTC-enabled conferencing platforms in large-scale production. The AnyMeeting API has already been leveraged in partnerships with large cable operators and telcos, as well as with platforms including Outlook, Zimbra, Google Apps and select vertical platforms in markets like real estate. AnyMeeting is now opening its API to new partners that wish to add WebRTC-enabled conferencing to their own services and platforms. AnyMeeting is a Gold Sponsor of WebRTC Expo IV in Atlanta, June 17-19, where Tuculescu will be a featured speaker on the plenary panel “Using WebRTC to Make Money”at 3:40pm Tuesday, June 17. AnyMeeting will also available at booth #218 for more information and demonstrations. Partners can leverage AnyMeeting’s proven and scalable API to quickly add screen sharing, multi-party video conferencing, phone and VoIP-based audio conferencing, online meetings with recording, and full-featuredwebinar capabilities to their own platforms and service offerings. AnyMeeting’s full-featured conferencing solution also works with non-WebRTC-supported browsers, providing a complete cross-platform solution. The company, which launched the AnyMeeting brand in 2010, has attracted more than 500,000 users and is a trusted partner to many large cable operators, telcos, platform providers and associations serving its target SMB customer base. Based in Orange County, California, AnyMeeting pioneered the small business Web conferencing market in 2009 with a completely free, full-featured and easy-to-use web conferencing service tailored for small business. Since then, it has grown to more than 500,000 small business users of both its free ad-supported service and low-cost ad-free options. Designed specifically for small business, AnyMeeting offers a complete web conferencing and webinar service built on the company’s proven Software as a Service platform. Meeting hosts are able to invite up to 200 attendees per meeting with no time limits, and enjoy a full range of features including integrated video conferencing, phone conferencing, screen sharing, presentation sharing, recording and social media integration. AnyMeeting is the best choice for small businesses, independent professionals and just about anyone who can benefit from online meetings. Current investors include Tech Coast Angels, Pasadena Angels, Maverick Angels, Sand Hill Angels and Keiretsu Forum. 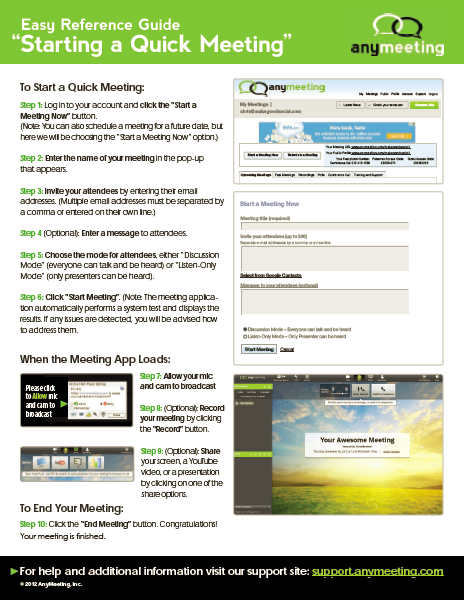 For more information, please visit www.AnyMeeting.com. Canfei Nesharim (Hebrew: The Wings of Eagles), which educates the Jewish community on environmental protection, submitted a presentation entitled Connecting to the Heart. The organization is made up of over 300 change agents around the world, who use materials to educate their Jewish communities. 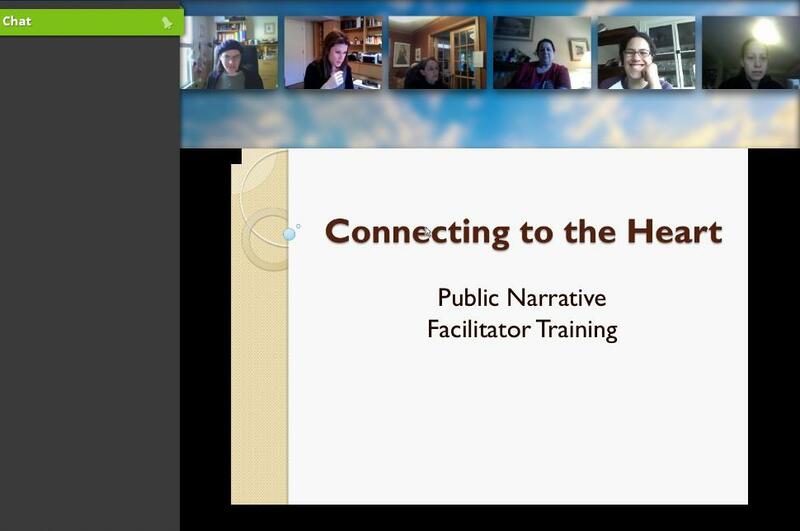 Canfei Nesharim used AnyMeeting to organize a series of webinars to help change agents learn how to organize more effectively in their communities. Evonne Marzouk, the organization’s director elaborates further on their experience with AnyMeeting. With technology becoming more cost effective and reliable, you may find yourself in the position of making remote video presentations more often. Travel costs are high, and as a presenter it often makes sense to do a remote presentation to save time and money for both you and your client. Anytime you give a presentation, there are general guidelines you want to follow to make it interesting and relevant to your audience. Giving a remote presentation adds a layer of complexity because of the technology involved. In addition, if you are not in the room it is not possible to see the audience’s body language and adjust. Special considerations need to be made for remote presentations to make sure everything goes smoothly. The fact that you are presenting from a remote location can cause you to get so caught up in the technology arrangements that you forget to prepare your presentation thoroughly. The first key to an effective video presentation is to simply prepare an effective presentation. Here are four steps that can help. Create your content with your audience in mind. Rather than starting off with a self-introduction, start off with something that will capture your audience’s attention. Tell a story or give an interesting fact. Follow up with an explanation of the problem, solution, and an action step they can take. Stay Focused on the Topic. Make sure both your script and your visuals relate to the topic at hand. You don’t want your audience wondering when you will get to the point – especially if you are doing a remote presentation, where an audience member is more likely to multi-task or slip out of the room. Maintain Good Body Language and Tone. Make sure your body language is good – posture, smile, and use of your hands while speaking. Don’t pace or have other distracting movements. Also, make sure your tone is the right volume and pace. You want your audience to hear you and be able to understand what you are saying, especially when dealing with video conferencing technology. Finish Early. Saying more is not always better. In an era of short attention spans, it’s a good idea to finish early. Not only does this leave more time for questions, it also helps you stay focused and efficient. This is the part of a video conference that makes everyone the most nervous. What if there isn’t enough bandwidth to handle the video? What if the sound stops working? There are many video conference horror stories, and you want to make sure your presentation isn’t one of them. Here are four steps you can take. Have Someone Watching the Software. During your presentation, have someone assigned to keep an eye on the conferencing software. Make sure this person reads up on troubleshooting tips before the event and thoroughly understands how the software works. This can be your go-to person if something fails while you are live. Do Two Practices. Most people know that it’s a good idea to do a run-through before the event just to make sure everything is working smoothly. Unfortunately, this practice generally happens about 20 minutes prior to the live presentation. It’s actually a good idea to do two practices. The first one can be a technology check, making sure that the video is clear and audio is working. The second one will be for feedback – do a portion of your presentation and let your on-site coordinator tell you if your tone or pace is off, or if your visuals are hard to see. Making these adjustments is key to a successful presentation. Arrange for Audience Feedback. This can be done through chat channels if there are enough computers, but another great solution is to have your on-site coordinator give you behind the scenes feedback. I’ve heard of a system where the coordinator would text different letters to the presenter to let her know if the audience was engaged, bored, or had questions. This can help you overcome the distance and adjust your presentation to your audience needs. Relax. Perhaps something will go wrong. If you are relaxed and go with the flow, your audience will have a much better impression than if you panic. Have a print-out of your presentation available to be handed out on-site if everything goes wrong. Other than that, just relax and take things as they come. Both you and your audience will have a better experience. Doing a remote video conference can save a lot of time and money for both the speaker and the client. By following the above eight simple steps, you can make sure that you are prepared to deliver a great presentation with as few technical issues as possible. Good luck! HUNTINGTON BEACH, CA–(Marketwire – Dec 13, 2011) – AnyMeeting, the completely free web conferencing and webinar service, today announced a festive use for its service with the holidays in mind. AnyMeeting’s 6-way video conferencing feature allows users to connect with friends and family members who are in different locations at the same time and spread holiday cheer. See the complete press release on MarketWire. HUNTINGTON BEACH, CA–(Marketwire – Oct 10, 2011) – AnyMeeting, the completely free web conferencing and webinar service, today announced that it has redesigned its interface, giving a completely new look and feel that will totally reinvent the online meeting experience. Now, up to six meeting participants can broadcast video and audio simultaneously. This type of flexible video conferencing is an ideal tool for both small face-to-face collaborative meetings and large webinars that may include a multi-person panel discussion. See the complete press release on MarketWire.